A good Koh Phi Phi map is still hard to find (2012) as Google maps and Google earth have stubbornly stayed with the imagery of Phi Phi Don Village covered with a layer of cloud. This has ensured that a bit of the old fashion 'map by hand' still plays a part in the standard Phi Phi Map. The majority of the islands show up well on the Koh Phi Phi map so you can see Phi Phi Ley with it's inlets of Maya Bay, Pi Ley and Loh Samah in all their glory. Bamboo Island Mosquito Island and the main beaches of Koh Phi Phi Don are all visible and make navigation straight forward. The best Koh Phi Phi Map is found on phi-phi.com as it over lays a street map onto Google maps where the cloud covers the village. As you zoom in the streets and locations of the resorts, hotels and guesthouses, dive schools, bars and restaurants and shops become clear. If you mouse over each icon it describes what is here or click each resort, hotel and guesthouse to go the fact sheet for that page. If you click on the green icons it gives you the places of interest and the red one for the reefs and dive site. The full list of icons is below the map. Koh Phi Phi map on the hotel fact sheet pages show you the map without any of the other icons on the page so you get a good geographical sense of the position and location of the accommodation. At the top of these maps there are links to "Hotels near by" and the "All Hotels in the same location". Here is the map for the accommodation in Phi Phi Don Village. The main Koh Phi Phi luxury resorts are found in the north of Phi Phi in Laem Tong Beach and Loh Bagao but the Phi Phi Island Cabana Hotel is the main resort in the Phi Phi Don Village. Zeavola Phi Phi Resort map, Holiday Inn Phi Phi Island map and the Outrigger Phi Phi Island Resort and Spa map (formerly the Phi Phi Island Village Resort And Spa). When you arrive at the pier you can pick up a Koh Phi Phi map at Siam UK Travel and Tours which is 70 meters from the pier. Look out for the large yellow sign. This Koh Phi Phi Map is a third of an A4 piece of paper when folded but opens up to A3 size. It shows all the main streets of the Phi Phi Don Village along with a plot by plot description of every hotel, guesthouse, dive shop etc. It also promotes many of the local businesses. It is a great reference guide to the busy part of the island. 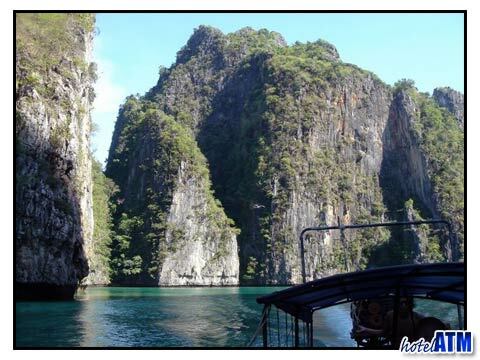 If you go to the Overview Articles of Koh Phi Phi you will find further information on 'Best of ..', 'Best diving …', 'Top 10 things to do ..', 'Phi Phi Island Facebook', 'Koh Phi Phi discount', 'What to do on …’.